As mentioned in the introduction, the origin is problematic. One of the difficulties is how (or whether) the site could have been both a death trap and a habitat for aquatic animals, particularly large ones. The clays are layered, and not bioturbated as would be the case if animals were mired in a sticky material. Many bones are articulated and none have been gnawed or scattered by scavengers. The diagrams below were prepared as part of a poster presentation at the 2005 Tennessee CritterFest at the Nashville Bicentenial Mall. The original version showed a partially empty Stage 2, with a substantial free-fall into the water. A large empty space, a cavern above a lower water level would explain the presence of cave onyx, blocks of which were found in the clays. However, in that case a visible pool of water might not have been present, a likely attractant to animals during dry seasons. It is also possible the water level would rise and fall with the seasons. Not shown is the source of sediment and debris-laden surface waters. These may have cascaded directly into the hole, or entered via a sink some distance away. 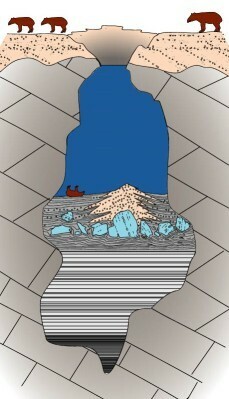 A high-resolution gravity study conducted by George Whitlaw (see Links) indicates the structure may be more complex than shown here, and suggests several partly merged bodies of sediment are present. Stage 1. 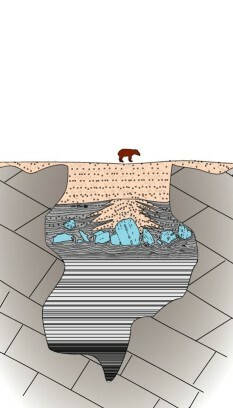 Openings form underground, perhaps a joint-controlled cavity in the phreatic zone. It fills with a slow influx of sediment, derived from a nearby sinking creek. Stage 2. 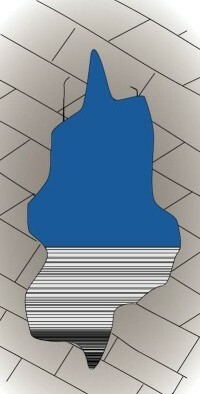 After surface erosion, roof collapse activates the trap. Slanted layers of dots indicate in-place residuum, the typical reddish clays of the region derived from weathering of cherty bedrock. Stage 3. After further erosion and infilling, with buff-colored transported gravels, the buried trap is preserved. Stage 2.5 (not shown) is the downward-warping of clay layers as they compact under their own weight before deposition of the top layers of gravel. Stage 4. 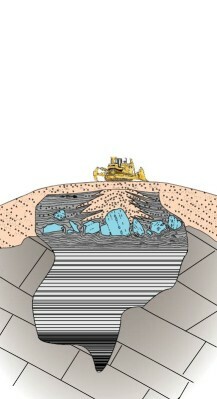 Prior to its discovery, the deposit forms the core of a small knoll. Oxidation also has proceeded within the upper parts of the organic and fossil -rich clays.partly destroying many fossils.